According to new research by global consulting firm Protiviti, there’s a disconnect between what procurement leaders claim as savings and what their finance partners give them credit for. A recent report from Harvard Business Review identifies three things procurement organizations can do to increase their effectiveness and, in turn, their overall value to the organization. Today Amazon Business kicks off back-to-school shopping with deals to help teachers, school administrators and educational institutions save money. One key to saving money for procurement leaders is controlling unmanaged spend, which improves efficiency and eliminates waste. Despite that, procurement professionals report that nearly half of their total spend remains unmanaged. It’s official: Tuesday, July 11, will be Prime Day for 2017. There will be deals in every department, including a large selection of business products. Explore three ways to make sure you get the most out of Prime Day with your Amazon Business account. Open Buy with Amazon Business gives Coupa users visibility and instant access to millions of items beyond the purchasing catalogs managed by their employer. Are you attending an industry conference or trade show this spring? 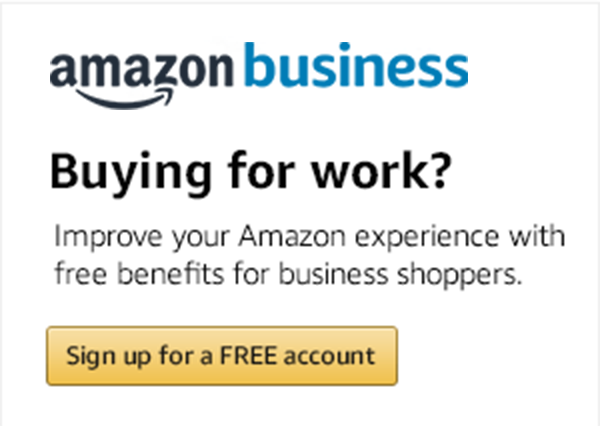 Keep an eye out for Amazon Business.